The Yantra has to be drawn on an Ashtami or Chaturdashi of the Krishna Paksha of the Hindu Lunar month [the eighth or fourth day of the dark fortnight of the Hindu Lunar month]. The Ashtami or Chaturdashi has to fall on a Sunday. This Yantra has to be prepared facing the East, on Bhojpatra with the paste of Ashtagandha. 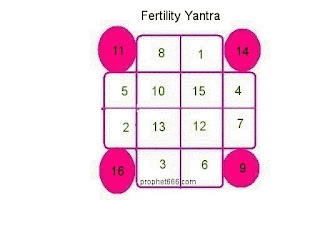 Then to use it on a woman; who otherwise normal; but unable to conceive for a long time; the Yantra has to be tied around her waist by putting the Yantra in a Copper Locket. To use it for obtaining more produce from the land; it has to be buried in the land. Doing this is said to double the produce from the land. Before and after preparing the Yantra the Fertility Mantra given here, which is a Shabar Mantra; has to be chanted with concentration. The same should be the case before and after using the Yantra. Hello Sir, Can you also provide information on the next coming relevant day to prepare this yantra.